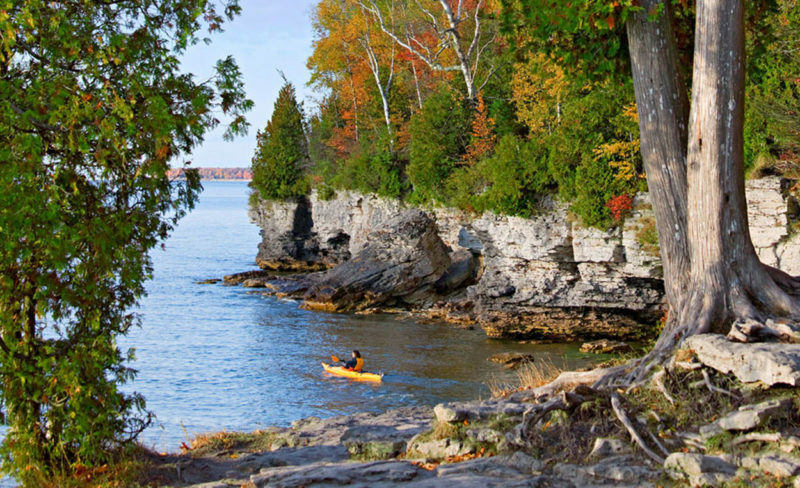 Take a day trip to the Door County Peninsula! Offering over 300 miles of shoreline, there is always something new to do or see! Along the shoreline, the Door County Peninsula has 53 public beaches with a variety of activities to enjoy! If you are into sports you may want to visit the Nicolet Beach, within the Peninsula State Park. This beach offers paddle board rentals, a playground, and sand volleyball. For those who want to visit the local shops, both the Sister Bay Waterfront Park and the Egg Harbor Beach can be found downtown. For the most scenic beach in Wisconsin, visit the Whitefish Dunes State Park for a stroll down the mile-long shore. If you’re trying to avoid the crowds for a more peaceful excursion, try stopping by the Sandy Bay Town Park or the Ridges Beach in Bailey’s Harbor. Or hop on a couple ferry rides to get to one of the nation’s most beautiful beach at Rock Island State Park. Along with 300 miles of shoreline comes lighthouses! The Door County Peninsula has 11 historic lighthouses available for the public to visit. The Door County Peninsula offers many family-friendly activities for people of all ages to enjoy. Take a self-guided tour around The Farm, a petting zoo that offers the opportunities to feed goats, pigs, ox, cows, and so much more. They also have old farm equipment to view, and a gift shop to help you remember your experience! You can also enjoy a movie at Skyway, one of the last drive-in theaters in Wisconsin. For a souvenir that really represents Door County Peninsula, thought, you need to go cherry picking! Choose from a variety of local orchards to find the sweetest cherries for your next recipe! The Door County Peninsula is the wine capital of Wisconsin. With hundreds of wine tours available, you can find your new favorite wine. Hop on the Door County Trolley to travel along the Wine Trail, which visits the most popular wineries on the peninsula. Tour the cherry orchards or vineyards to see the growing process. Then, sample the wines of your choosing. There is no wine quite like Door County wine, so don’t forget to take a bottle or two home to enjoy with friends and family!